Quality Air Heating and Air Conditioning > Articles > Commercial Services > What Are Packaged Units and Why Are They Good for Commercial HVAC? What Are Packaged Units and Why Are They Good for Commercial HVAC? Commercial HVAC systems use the same principles of operation as residential systems—but they are similar in few other ways. Commercial air conditioners and heaters are larger, modular, and differently configured, and for this reason they require commercial specialists to install, repair, and maintain them. One of the common types of commercial HVAC systems rarely seen in homes is the packaged unit. These are the great workhorses for keeping businesses cooled and heated. If you are looking for commercial HVAC services in Delaware, whether to install a new system or to service a current one, chances are high that you are dealing with a packaged unit. Make sure you contact a contractor with the right experience: Quality Air Heating and Air Conditioning offers extensive commercial services that will help keep your work place comfortable. The packaged HVAC system or the “all-in-one” system contains all the necessary components for heating and/or cooling inside a single cabinet. This is different from the “split” system that you see for most homes and some businesses, which have an outdoor cabinet (called the condenser in an air conditioning system) and a separate indoor cabinet hooked to the ductwork. The packaged unit contains the same components as a split system: two sets of coils, fans, blowers, motors, condensate drainage, and refrigerant. Packaged units can come either as air conditioners or heat pumps. What Are the Advantages of Packaged Units for Businesses? There are a number of reasons why installing packaged units is popular for commercial HVAC. For one, removing the indoor unit and combining it into one outdoor cabinet means a significant drop in noise level for a business. Another is that they are much easier to service for technicians, who can solve almost all heating and cooling problems from one location without needing to disrupt the workplace. The horizontal or down-flow design of packaged systems that are located on the roof (the most common spot for installation) also increases energy efficiency. The all-in-one configuration permits for easier modular design, so businesses can expand their HVAC system without needing to retire the old one and dispose of it. The comfort of your business is something you should never take lightly: it means better productivity for your employees and happier customers/clients/tenants. 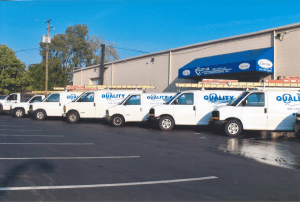 You would never want someone inexperienced at his or her job to handle the crucial work necessary to install or care for your business’ HVAC system, so call our experienced team at Quality Air Heating and Air Conditioning. We have a NATE-certified staff ready to assist you.